Designed to reduce on-site labor with pre-manufactured assemblies, minimizing the number of tiny parts you need to put together. Supports up to 20 GPU mining motherboards: Asus B250 Mining Expert (19 GPU) and Asus H370 Mining Master (20 GPU). Supports 1 ATX/Micro-ATX motherboard, 3 PSU, 20 or 16 GPU, 10 x 120 mm fans; Fully assembled rack dimension is 620 x 640 x 360 mm. Equipped with easy to install (or replace) fan holder plate for 10 x 120mm fans, and reversible GPU bar with 20x or 16x mounting hole patterns. 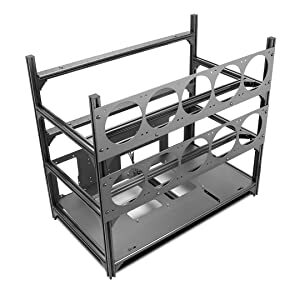 Includes pre-assembled Fan Holder, pre-assembled GPU Holder, pre-assembled PSU/SSD/HDD Holder, pre-assembled MB Plate, and pre-assembled Support Sticks. 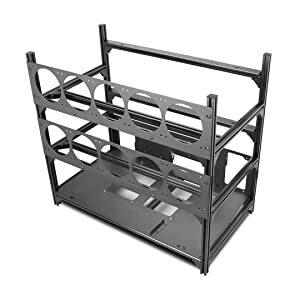 The Hydra 5 is a custom made open frame rack designed to reduce on-site labor. By deploying pre-manufactured assemblies, the Hydra 5 minimizes the number of tiny screws you need to put together. If you don't consider yourself very handy, this is a great way to save both time and money. It supports twenty full-length graphics cards, one ATX/Micro-ATX motherboard, and three power supplies. 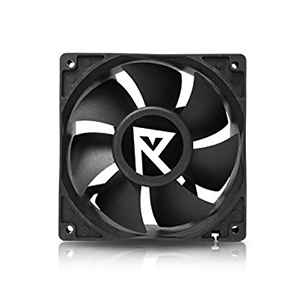 You can install up to ten 120 mm case fans to blow air around the equipments. The Hydra 5 is designed for the latest crypto-mining motherboards that can handle 19 or 20 GPUs, such as Asus B250 Mining Expert (19 GPU) and Asus H370 Mining Master (20 GPU). This is the best choice for companies on a tight schedule and requires fast deployment. 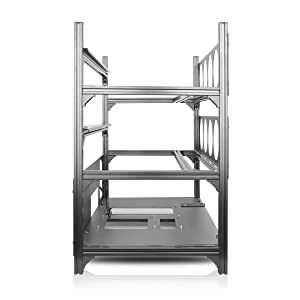 Open frame racks give you quick access to components, and can be easily stacked. The Hydra 5 comes in pre-manufactured assemblies to minimizes the number of tiny screws you need to put together. 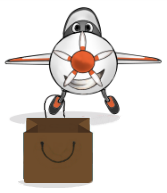 This is the best choice for users on a tight schedule and requires fast deployment. 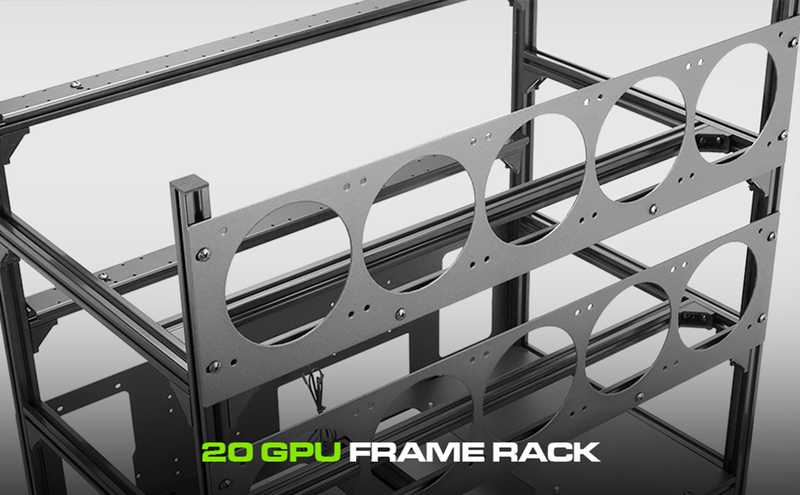 Open frame racks give you quick access to components, and can be easily stacked. 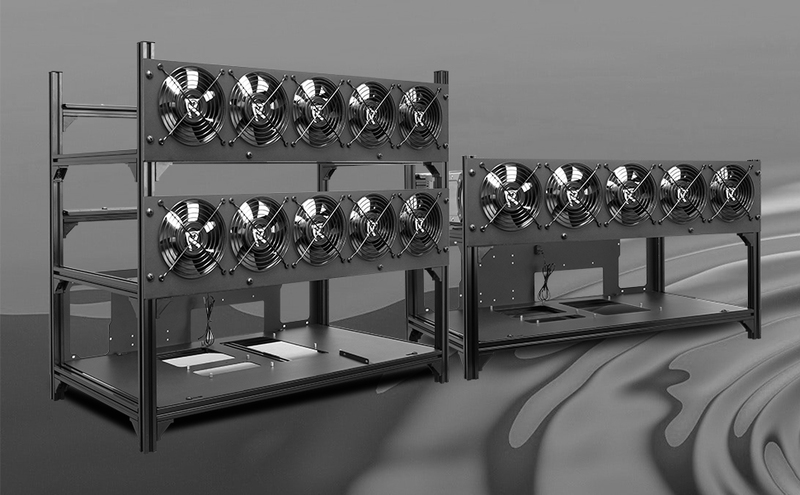 You can install up to 10 x 120 mm high RPM server fans at the front of the chassis. 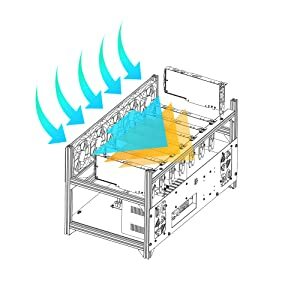 Those fans help blow the hot air out at the back of the case. Easily add (or remove) fans using the pre-assembled Fan holder plates. Aftermarket cards tend to be taller around 140 to 150 mm, and some are longer around 300 to 330 mm. The Hydra 5 has taken into account all these details to ensure everything fits. You can fit up to 20 dual slot cards or 16 triple slot cards. Easily install cards of different height, length and width. Switch from twenty 2-slot to sixteen 3-slot mounting patterns. Bottom shelf with clearance and airflow for those who plan to stack a second rig on top of the first one. Protect your motherboard and power supplies from dangerous exposures. 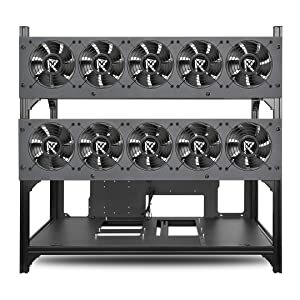 Mohon maaf, produk Hydra V 20 GPU Frame Rack Mining Rig Case, Triple PSU Ready (Crypto Promo) sementara ini sedang habis.